It’s easy to think of the benefits of 3D printing for teaching anthropology. The new technology allows professors to digitalize fragile fossil and bone samples for classroom use—creating a great visual teaching aid. As it turns out, 3D printing has considerable benefits for anthropologists outside of the classroom as well. For one, increasing access to fossil samples for scientists is putting collaborative research on the fast track. Digitizing fossils and making the files available to universities around the world allows more scientists to study them and bring novel hypotheses to the table. The traditional use of rubber or silicon models used to serve this purpose to a degree, but when it comes to studying the incredibly rare examples of fossil hominins (extinct species of humans), even minor errors can lead researchers down the wrong path. The old style of modeling can create bulges, bubbles and other inaccuracies in the fossil copy, especially when you’re not using the original sample. The incredible detail involved in 3D printing technology prevents these types of errors. Despite being a fairly new technology, 3D printing is already aiding anthropologists make some groundbreaking discoveries. Paleoanthropologists at Stony Brook University Department of Anatomical Sciences are utilizing 3D morphometric analyses to paint a cleaner picture of our evolutionary tree closer to Lucy’s time (australopithecus afarensis, 3.9 to 2.9 million years ago). 3D printing allowed them to get a much more detailed view of the characteristics of the femur of Orrorin, a 6 million year old fossil that could be one of the earliest hominins. 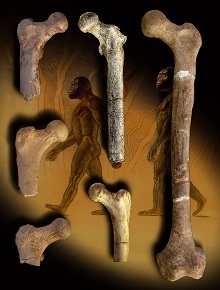 By comparing the femur with Lucy’s species and other samples, they were able to determine that Orrorin likely lived in trees but walked on two feet like Lucy and modern humans. Anthropologists at the Max Plank Institute for Human Evolution are in the process of digitizing their collection of hominin fossils. Their CT machines can create a resolution as detailed as 0.8 micrometers, much better than traditional medical scanners. This allows for unprecedented analyses of miniscule structures, such as tooth enamel. This may not seem like an incredibly exciting ability, but the vast majority of discoveries in human evolution have come from analyzing fossil dentition. Breaking open rare fossil samples to learn more about their internal structures has never been an option, but 3D versions give researchers the ability to remove layers digitally. This turns fossils that were discovered 30 years ago into novel specimens again, as inner structures such as tooth roots and ear cavities become easily visible. 3D printing is helping answer questions about our much more recent past, by allowing researchers to run simulations that wouldn’t otherwise be possible. For example, researchers at the Anthropological Institute at Zurich University were able to digitally embed the remains of three Neanderthal infants into the pelvis of a Neanderthal woman, giving new insights into brain size at birth and the nature of childbirth for Neanderthals, who were once our closest living relatives. The partial pelvis was discovered in the 1930s and has been thoroughly studied, but with the help of 3D printing, the sample is allowing researchers come up with new answers to old questions. The high-resolution CT scanners anthropologists need to conduct these studies are costly, so it will be a while before the majority of universities can benefit from the technology. Still, the possibility of making digital copies of every known fossil hominin available to universities across the world is an exciting prospect for future discoveries.